Piezo1D | TASI Technical Software Inc.
Piezo1D models the behavior of 1-dimensional electromechanical devices to predict performance using Mason's and the KLM Model. Simple electromechanical systems under certain conditions can be modeled in 1-dimension to yield frequency-dependent characteristics of the device such as input impedance, insertion loss, power factor, velocities and stress at the boundaries of layers of the device, and operating parameters such as the device’s pulse-echo behavior. 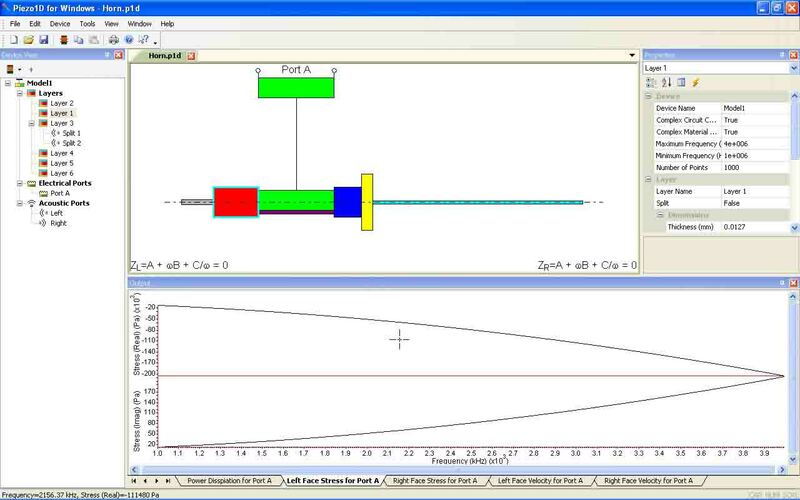 Piezo1D uses Mason's or the KLM network model to analyze a 1-dimensional electromechanical device. In principle any number of piezoelectric and elastic layers can be combined in any order to create models of any device operating in 1-dimension. Using an intuitive user interface, even complex models can be constructed in minutes. Once the structure of the model is defined, properties of the layers can be adjusted while the impact of these changes is immediately reflected in the computed outputs. Piezo1D runs under Windows XP and above including Windows 10. Released in 2018, Version 1.0 of Piezo1D is a 32bit Windows application that runs under Windows 7 and above. It will also continue to run on Windows XP systems. All releases of Piezo1D are available for download. Any of these revisions can be activated in Basic Mode. With a Customer Number valid for the release date of each revision, the software can be fully enabled.